Each of the above four modules will cover two days of lectures, after which a practical activity (group work) will be held to test the knowledge and the skills acquired. 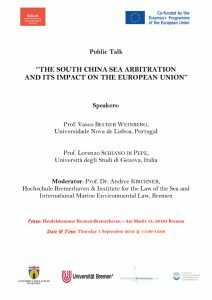 Two field trips are being planned to Bremerhaven and Hamburg to visit the port area and the premises of the International Tribunal for the Law of the Sea, respectively. Watch this space to be informed of any development. Please note that the list of subjects is subject to amendments until confirmed as final. 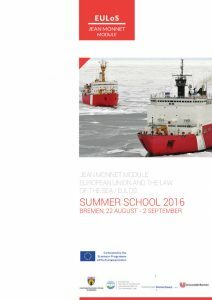 The detailed programme of the summer school is now available for download. The flyer of the public talk to be held at the Bremen Chamber of Commerce is now available.